Although it would hamper the convenience of using GTX, you can switch off the View Bar, and/or the Speed Bar and/or the Mini Speed Bar. To remove any of these bars, on the Menu Bar, click on Setup, then Tool Bars. To restore any removed bars, replace the checkmark in the relevant checkbox. At times you may need to add more buttons to a Tool Bar, or to remove one or more, and you can do this on all Tool Bars except the Mini Speed bar. The process is the same for all Bars, but for the purpose of explanation, we will add Form Filter 6 button to the Filter Bar on the Form View. 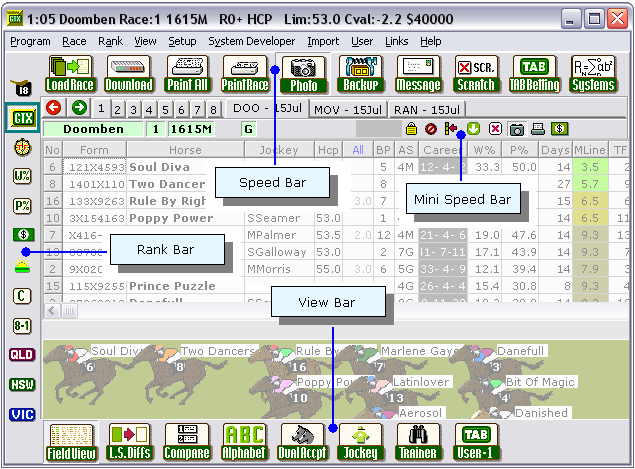 Firstly, select the Form View by clicking on a horse's name, then open the Setup Tool Bars box by clicking on Setup>Tool Bars on the Menu Bar. 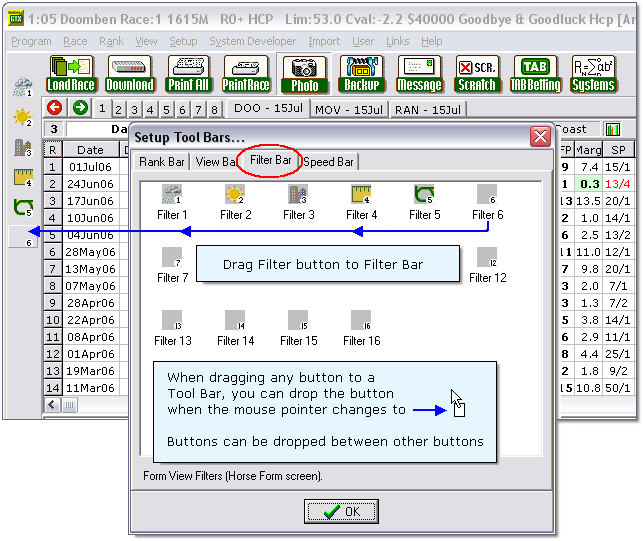 Using this example, you would then select the Filter Bar tab at the top and you will see the display of available Form Filter buttons. Then it's just a simple matter of dragging the button over to the Filter Bar and releasing the mouse button. When you're finished, click OK.
To remove any button from the various Tool Bars (except Mini Speed), hold down the Delete key on your keyboard while you click the button to be removed. As well as the switch on/off function, the View Bar, the Speed Bar and the Rank Bar can each be customised with two types of user-selectable buttons. The top bar of the image above shows the View Bar in its default state when GTX is installed. You are able to replace these buttons with the smaller versions shown in the lower bar. To change the buttons, you first need to remove the existing buttons from the View Bar. To do this, hold down the Delete key on your keyboard and click on each of the View Bar buttons in turn. When they are removed, click on Setup on the Menu Bar, then Tool Bars. If, for some strange reason, you wanted a mixture of large and small buttons, make sure that the last button you add is a large one, as the View Bar panel adjusts its depth to the size of the last added button. If the last button was a small one, you would find that the tops would be cut off the larger buttons already in the View Bar. This same feature as above in the View Bar section applies to the Speed Bar. To change the buttons that are already on the Speed Bar, firstly hold down the Delete key on your keyboard and click on each of the buttons. When they have been removed, click on Setup on the Menu Bar and then select Tool Bars. 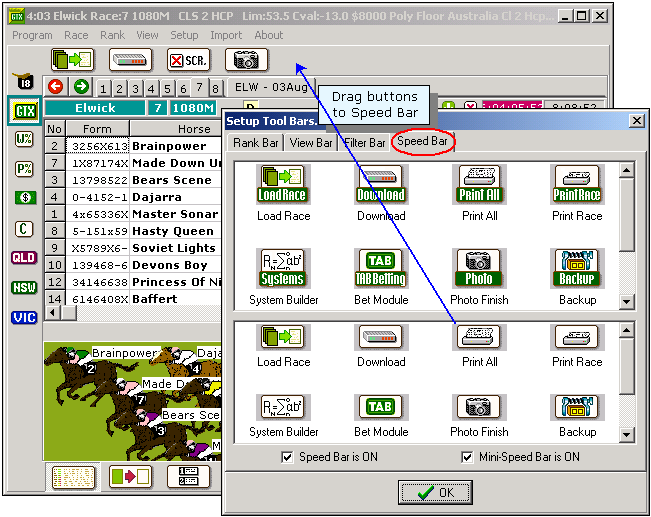 The Setup Tool Bars box opens – then click on the Speed Bar tab. Again, you will see the two pane display of the larger and smaller buttons that are available for the Speed Bar. Then just click on each button in turn and, holding down the mouse button, drag each button to the Speed Bar. When finished, click OK.
As with the View Bar, you may see buttons in the Setup Tool Bars box that are not relevant to your version of GTX, however it is not possible to copy them to the Speed Bar. Also the previous warning applies here. If, for some strange reason, you wanted a mixture of large and small buttons, make sure that the last button you add is a large one, as the View Bar panel adjusts its depth to the size of the last added button. If the last button was a small one, you would find that the tops would be cut off the larger buttons already in the View Bar. The Ranking Order Bar, in its default state , has the twelve buttons shown at left. Should you wish to change any of these in favour of the more ornate buttons shown in the top level pane of the Setup Tool Bars box, start by deleting the buttons you want to replace - hold down the Delete key on your keyboard and click on each of the buttons you want to remove. When they have been removed, click on Setup on the Menu Bar, then Tool Bars. When the Setup Tool Bars box opens, on the Rank Bar tab you will see the two paned display showing the larger buttons in the top pane and the smaller buttons in the lower. All you need to do is click on each of the required larger buttons in the top pane in turn, and holding down the mouse button, drag each button to its position on the Ranking Order Bar. To re-instate the smaller buttons, simply delete the larger buttons from the Ranking Order Bar and drag the smaller buttons from the lower panel.